My Diamond Shoes are Too Tight: A Discussion of Fame is a panel discussion and presentation bringing together three artists who have a critical and unique approach to celebrity. JD Samson, Josh Harris, and Ann Hirsch will explore some of the lesser discussed aspects of being a public figure, and will be moderated by Nathaniel Sullivan. This event is part of Fake It ‘Til You Make It, Flux Factory’s take on the traditional artist professional development series; it is free and open to the public, has a cheap bar, and highly values audience participation. JD Samson is a musician and artist best known as a member of the bands Le Tigre and Men. JD has written extensively about her own fame, cultural/political role, and the economics of being a successful artists. Josh Luvvy Harris started a leading Internet research firm Jupiter Communications in 1986. He took the company public and cashed out. In 1994, he founded the world’s first internet radio/television network, Pseudo Programs, Inc. He was the subject of the Grand Jury Prize winning documentary film “We Live In Public” at the 2009 Sundance Film Festival which made it into the permanent collection of the Museum of Modern Art in New York City; Josh ran the underground art scene in New York City during the 1990′s. Of late, he is the protagonist of a biography, “Totally Wired: On the Trail of the Great Dotcom Swindle,” as well as the subject of a fictional film entitled “The Gent” to be released next year. Mr. Harris’ current project, “Cybership.tv,” enables the audience to watch and interact with each other. Ann Hirsch is a video and performance artist engaging with the contemporary portrayal of women in media. She often acts as an amateur social scientist, inserting herself into popular culture and reporting back her findings in the form of art works. Some of these interventions have included bouts with YouTube celebrity, competing for romance on Vh1 and buying antiques on Science Channel’s Oddities. She was awarded a 2012-2013 Rhizome commission and was recently named one of 8 Brooklyn Art Stars by L Magazine. About the Series: Part artist boot camp, part motivational speech therapy, Fake It Till You Make It discusses the challenges of surviving as an artist in New York City. In this collection of playfully flippant classes, performative lectures, and discussion-based workshops, Flux Factory invites members of the NYC art community to reveal the secrets of their success. 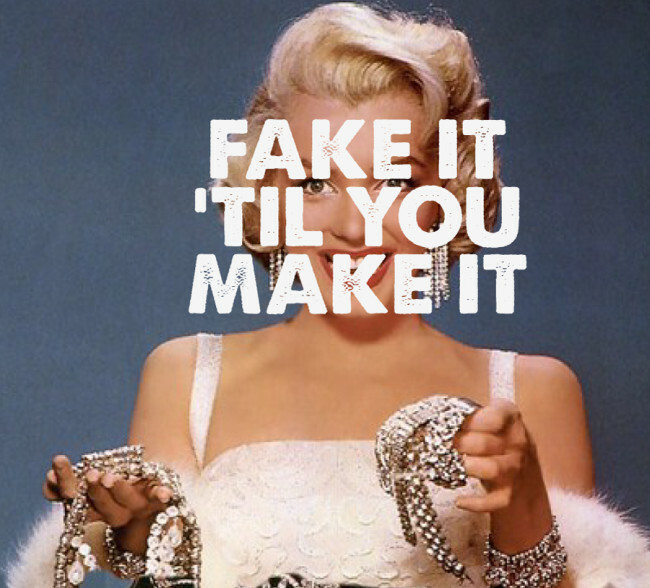 Fake It ‘Til You Make It is organized by Aliya Bonar, Alex Nathanson & Christina Vassallo. It is supported by National Endowment for the Arts and the New York City Department of Cultural Affairs in partnership with the City Council and the New York State Council on the Arts, with the support of Governor Andrew Cuomo and the New York State Legislature. February 13th, 8pm+ FREE!, but please bring something delicious to share. This month's Flux Thursday is organized by Flux Artists-in-Residence, Chris Stiegler, Serge Stephan, Zuzia Juszkiewicz, Ben Seretan, and Jimmy Riordan. It will be an night of curated experiences including poetry, movement and experimental food pairings.